Family and succession law are tightly bound together. Succession law is usually based on kindred relationships as established by family law. The trends established in the marital property laws and succession laws are often a result of developments in family law. Equality of spouses and of all children, regardless of their descent, is not without consequences for marital property laws and succession law. 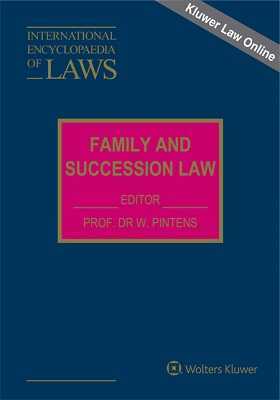 Therefore, this comprehensive comparative looseleaf set covers family law together with marital property law and succession law. In addition to the national monographs that follow the outline below, this subset of the International Encyclopaedia of Laws currently includes a monograph for the European Union. Forthcoming supplements will include international monographs describing the activities of several international organizations in the domain of family and succession law, such as the United Nations, the Council of Europe, and the International Commission on Civil Status. This set is primarily intended for judges, notaries, lawyers, and registrars of civil status who find themselves having to apply foreign laws as a result of applicable law rules of international private law. However, it is also of great value to academics and researchers, for whom it stimulates comparative studies by providing the necessary basic materials of family and succession law.